Score and snap. Breathaboard is a easy use, high performance biocomposite. UK Green Building Council. Easy Install Breathaboard. Breathaboard. High performance biocomposite board. UK Green Building Council office refurbishment. Breathaplasta on Breathaboard. Breathaboard has been recognised by construction industry professionals as a revolutionary innovation that could help to address the waste, resource security and health of the construction sector. We are currently working hard to validate and test the scalable and continuous production process so that we can hit the market at scale to ensure the impact that we set out to achieve. 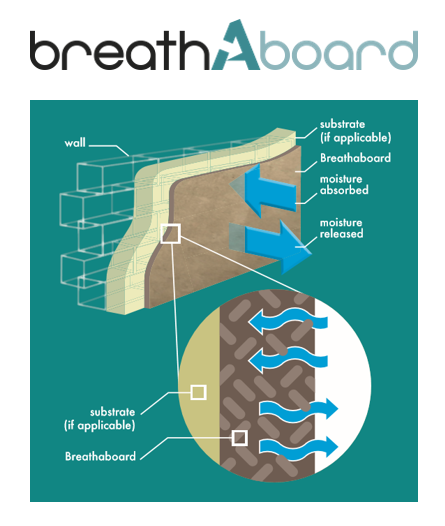 Rest assured, Breathaboard will be coming to a wall near you soon, but in the meantime, if you are looking for healthy, low carbon building products, be sure to check out our Breathaplasta. – Travis Perkins, Innovate Team. Unlike drylining board alternatives, Breathaboard passively regulates the moisture in the internal space through its breathability and moisture buffering capabilities. Reducing pollutants in the air, the likelihood of condensation and mould or mildew occurring and occupant health problems such as Asthma. All components are natural and sustainable. Breathaboard is completely biodegradable and non-toxic and the waste or off-cuts can even be used as a fertiliser! Can be used on walls, ceilings and floors in any room in the house. Reduction in noise transfer in comparison to plasterboard. No wastage and no fee for disposal of waste. Installed in exactly the same way as plasterboard, only lighter weight. The insulating properties of Breathaboard provide a superior thermal performance compared to alternatives.